If you believe in better performance then you should believe in hydraulic road (HydroR) brakes. We at SRAM believe – our competition has followed, so they clearly believe – as do our professional and amateur athletes. Quite simply, our 2015 HydroR technology is the fulfillment of the promise of better braking, more control, and improved performance in all conditions.For 2015 we have several road groupsets featuring a broad complement of hydraulic braking options for both rim and disc brake bikes. Each delivering on the promise of braking confidence and security that brings speed control and stability to a new level. 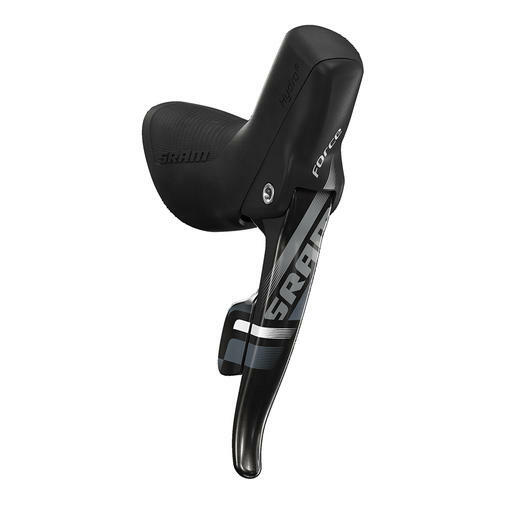 Speeds11 Rear/ 2 FrontCompatibilitySRAM RED 22, Force 22 & Rival 22 Yaw Front Derailleurs/ Exact Actuation Rear Derailleurs/ SRAM RED 22, Force 22 & Rival 22 HRR & HRDRecommended GroupSRAM Force 22Technology Highlight(s)HydroR/ Yaw/ DoubleTap/ Zero-Loss on Front & Rear/ ErgoDynamics Fit/ Independent E-Z Access Shift-Brake Lever Reach AdjustFinishTextured Hood CoversMaterialCarbon Brake Levers/ Aluminum Shift LeversShifters sold individually.